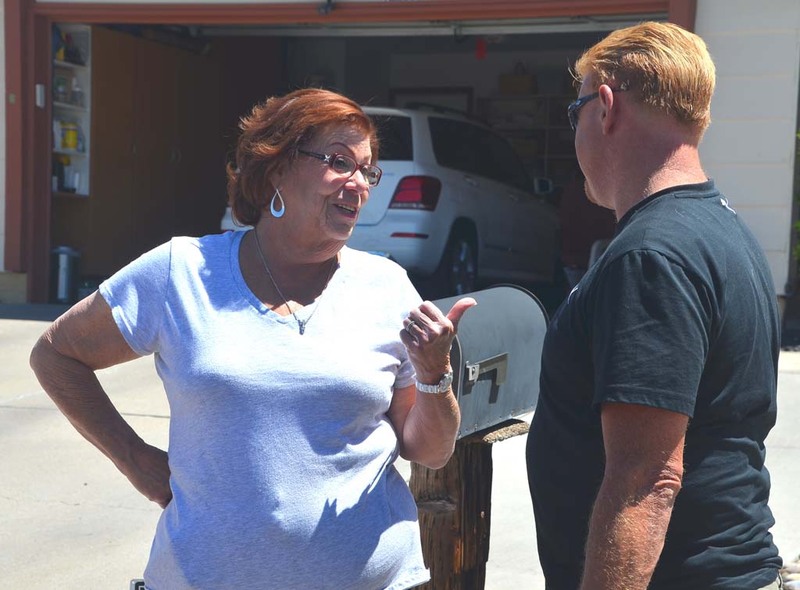 Fran Padilla, owner of the Albuquerque house that served as Walter White’s residence in “Breaking Bad,” talks with Frank Sandoval, owner of Breaking Bad RV Tours. Sandoval had a minor role in the series as a DEA agent. In Season 3, Jesse Pinkman, drug dealer and Walter White’s former student, buys this house from his parents. It eventually became a 24-hour meth party pad. 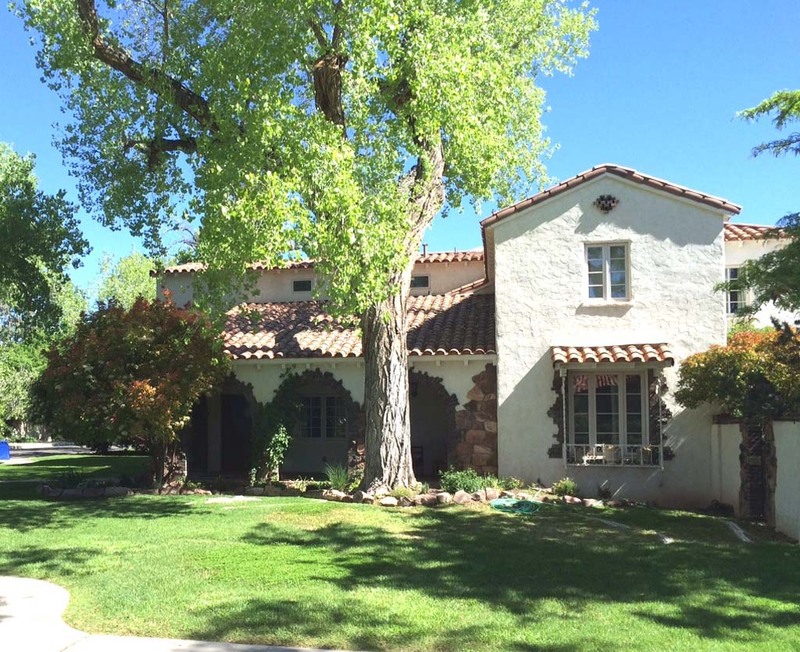 The house, at 9809 Margo St., is in a tranquil tree-lined neighborhood in southwest Albuquerque. 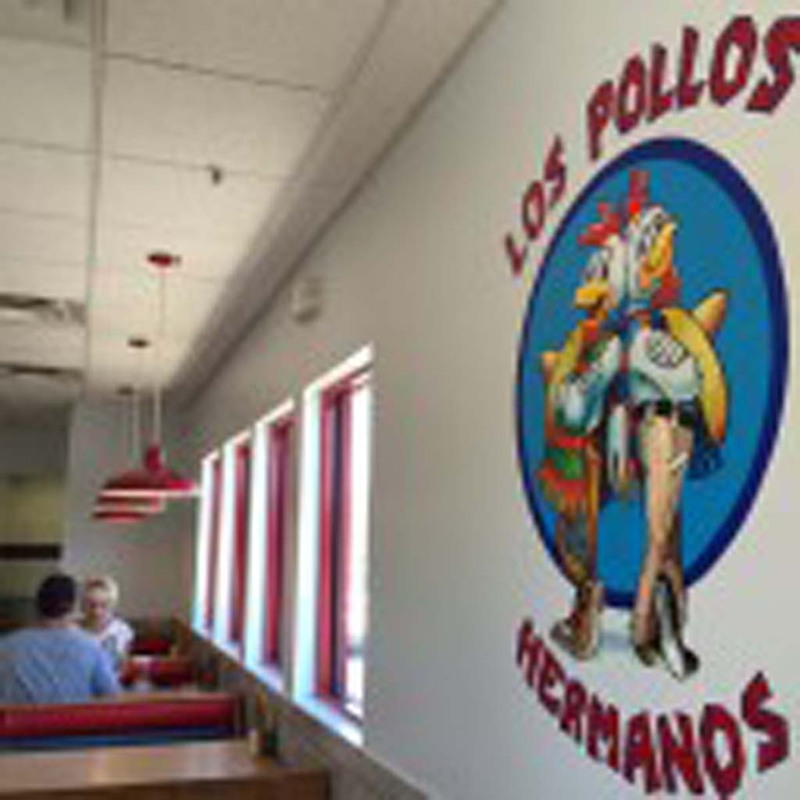 A Los Pollos Hermanos banner hangs just inside the door of Twisters to memorialize the restaurant’s role in “Breaking Bad.” The Mexican fast-food establishment in southwest Albuquerque served as a front for Gus Fring’s drug empire. 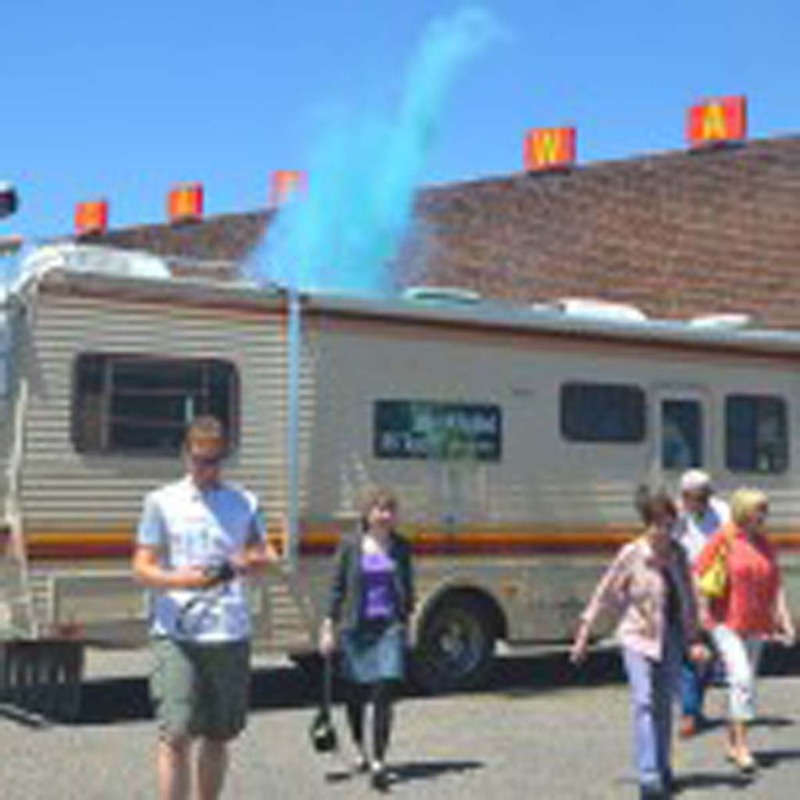 Dylan Wisneski, tour assistant, sets off a blue smoke bomb to mimic a meth-cooking scene from the blockbuster TV series “Breaking Bad.” Frank Sandoval, owner of Breaking Bad RV Tours, conducted a nationwide search for this 1986 Fleetwood Bounder, a duplicate of the two used in the TV series. One was gutted and a makeshift lab installed for the driving scenes; the other met its fate in the crusher (Season 3; Episode 6). The interior scenes were filmed on a set built in a box at an Albuquerque sound stage. 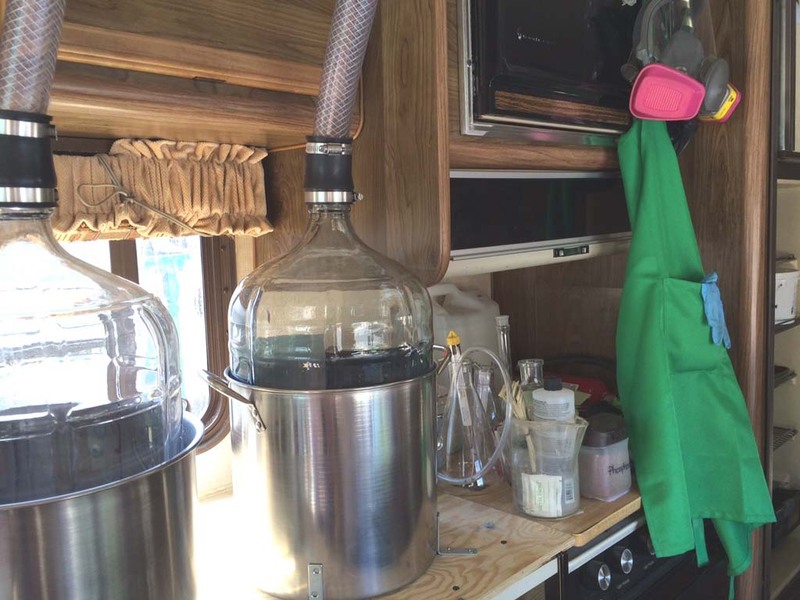 The interior of the 1986 Fleetwood Bounder RV used for “Breaking Bad” tours has been staged to look like the makeshift meth lab where Walter White and Jesse Pinkman “cooked” meth. 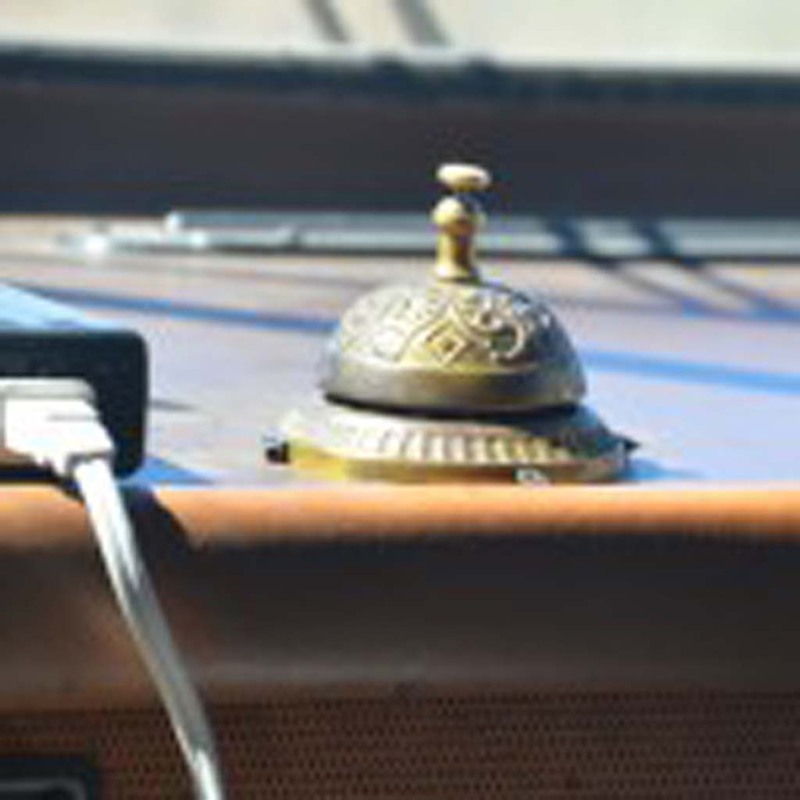 A brass bell like the one that played an important part in the plot of “Breaking Bad,” which aired from 2008 to 2013, sits on the dashboard of the 1986 Fleetwood Bounder. 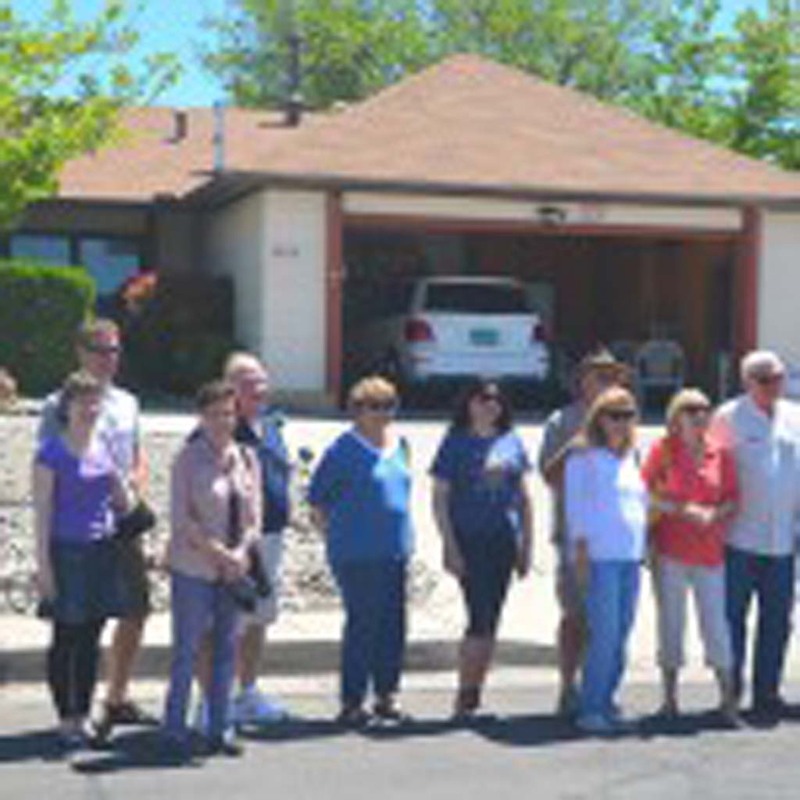 The RV is used for tours that take visitors to many of the Albuquerque locations where the series was filmed. 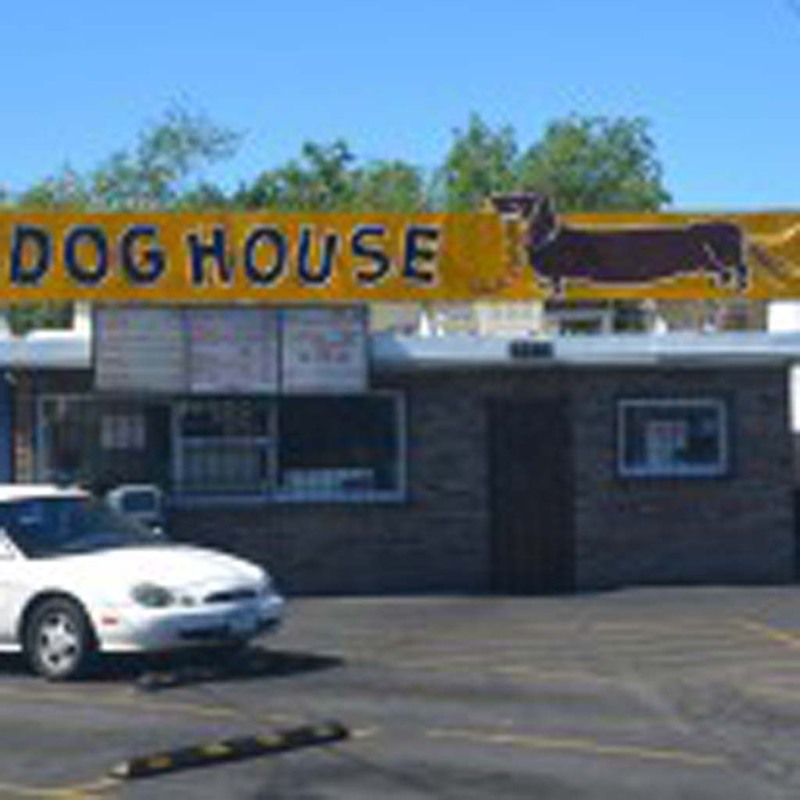 Not far off the old Route 66 is the Doghouse Drive-In, said to have great chilidogs and Frito pies. 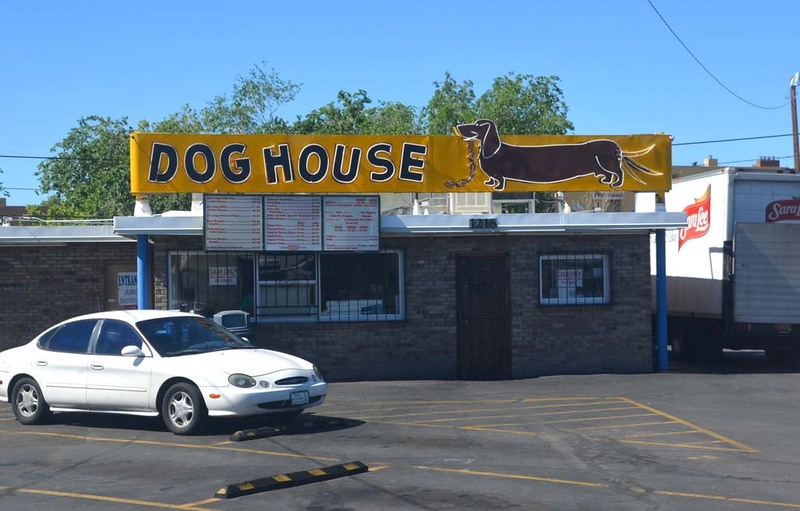 “Breaking Bad” character Jesse Pinkman visited this Albuquerque landmark several times during the series. 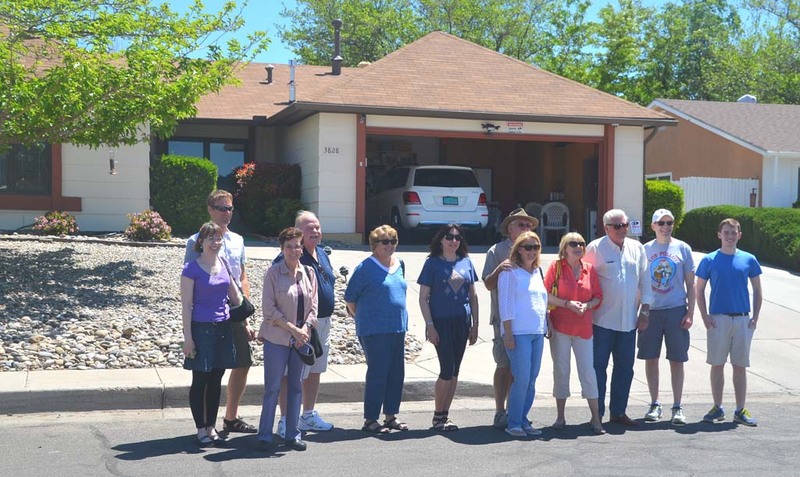 Tourists are a common sight at the Albuquerque residence that served as Walter White’s home in “Breaking Bad.” Owner Fran Padilla says that as many as 200 cars a day pass by. This tour group, which includes visitors from London and Switzerland, lines up for a photo. 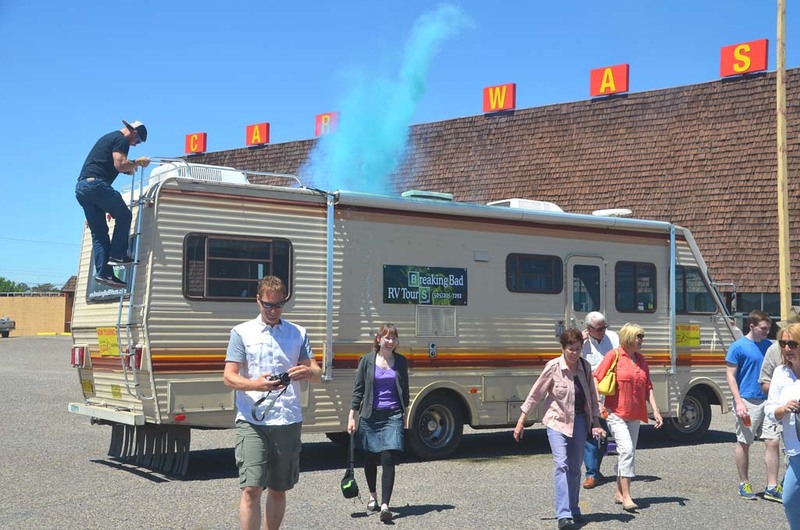 The Breaking Bad RV Tour takes passengers to 17 Albuquerque locations, and has recently added locations from “Better Call Saul,” a popular “Breaking Bad” spinoff, currently filming Season 2. There’s a yellow sign with red lettering on the lawn of Louie and Fran Padilla’s house. The Padilla’s need this highly visible admonition because, as much as some people wish it was, their home is not a public monument. Some days, as many as 200 cars a day cruise by the house in this Albuquerque neighborhood of Northeast Heights. And yes, there have been plenty of pizzas tossed on the roof (Season 3; Episode 2). “More pizzas than we ever want to see again,” says Fran, who stands on the sidewalk chatting with series fans. The Padilla home is the most-visited film/TV home in the country, says our driver/guide Frank Sandoval, owner of Breaking Bad RV Tours. 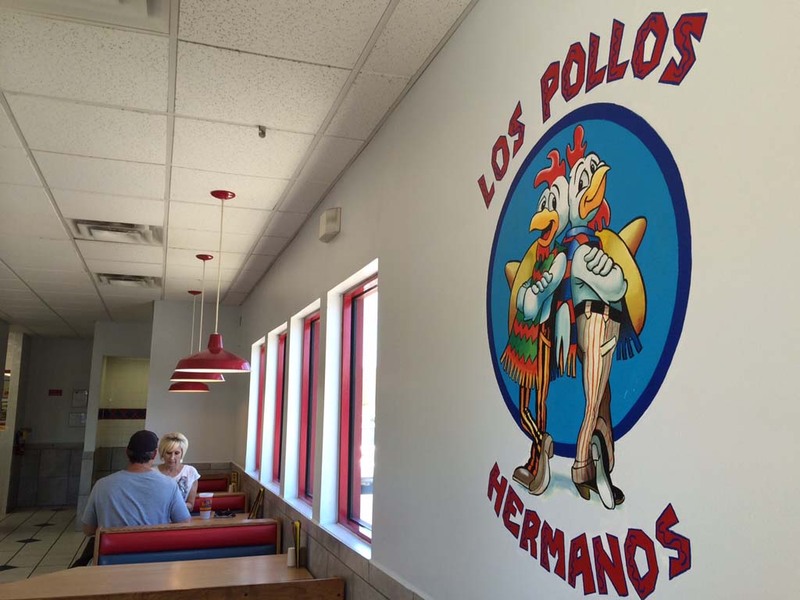 Has “Breaking Bad” been good for Albuquerque? 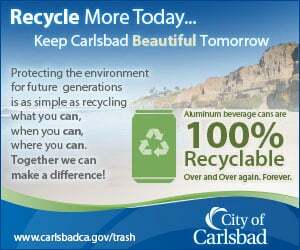 Without a doubt, says Tania Armenta, vice president of marketing for the Albuquerque Convention and Visitors Bureau. “We saw interest in the city increase about Season 4. Before that, most people were not aware of the state and what it has to offer. 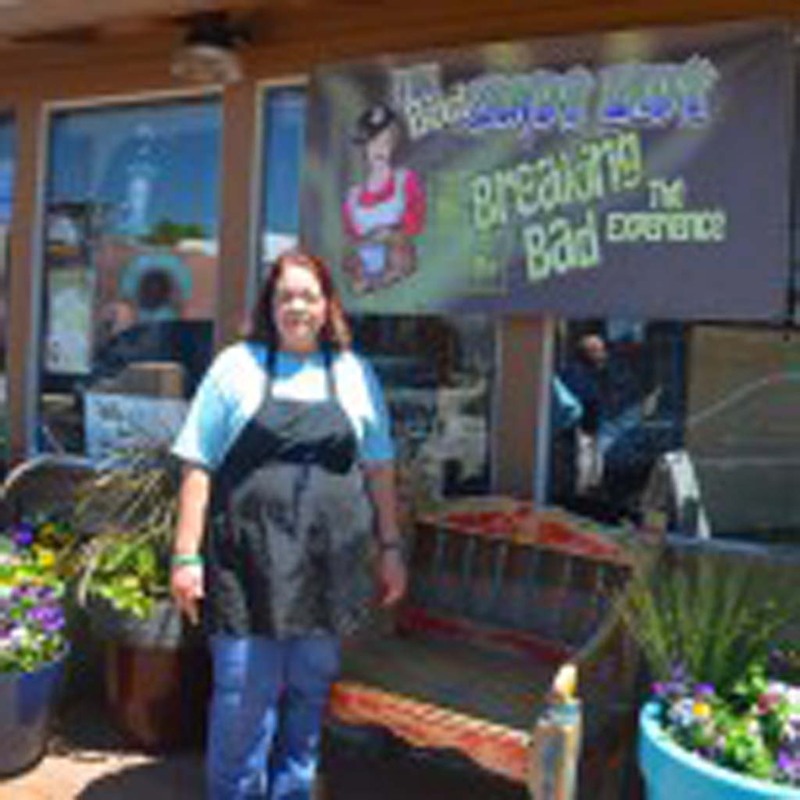 Besides visitor dollars, each episode of “Breaking Bad” (they total 62) brought $1 million to Albuquerque’s economy. 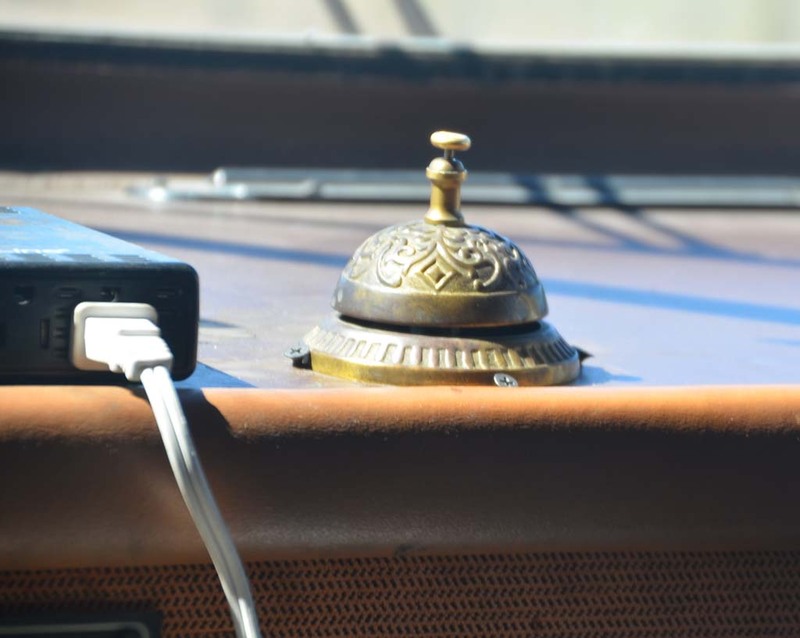 Sandoval began his tour in April 2014 after spending seven months of overhauling the RV and getting Department of Transportation approval. Since then, Sandoval, who had a minor role as a DEA agent in the series and does a credible imitation of Jesse Pinkman, has introduced Albuquerque to visitors from all over the world – Austria, Australia, Germany, Africa and Russia to name a few. Some of these fans are fanatics. A saner fan of the show, I didn’t start watching until the season was long over. Conversation about the show’s violence made me reluctant to join the legions of true believers. Then curiosity got the best of me and I peeked. I got sucked in quickly. So here we are, standing in front of the Padilla home, taking photos and talking with Fran. “People from the production crew just knocked on my door one day and asked if they could use my house,” she explains. At first, Fran thought it was a joke, then checked with the state’s film commission. These guys were for real. 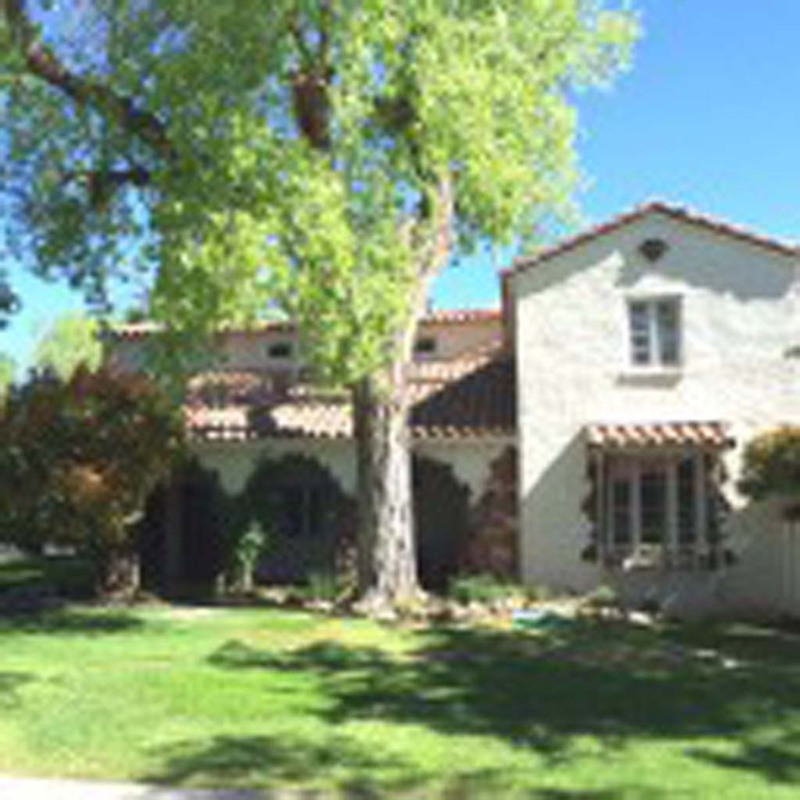 Only the exterior of the Padilla home was used, including the pool scenes. Initially, the director wanted to cover it, but writers insisted on working it into the script (think teddy bear’s floating eyeball and Skyler’s breakdown). Interior were shot in an Albuquerque sound stage. “Breaking Bad” has changed the Padillas’ lives. They’ve met people from all over the world. 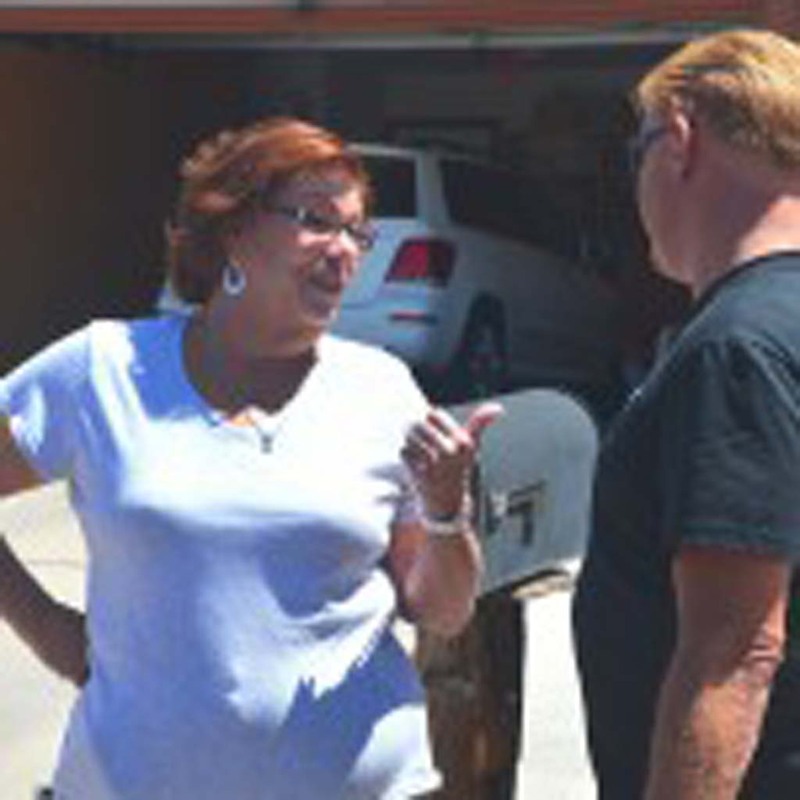 “Most of the time, they are nice and respect our property,” Fran tells us, but, according to Sandoval, Fran was (gently) hit by a car once when the driver refused to leave her driveway so she could keep a doctor appointment. Our three-and-a-half-hour tour ends at The Candy Lady, an Old Town Shop owned by Debbie Bell. “Bad” has been good to her, she says. 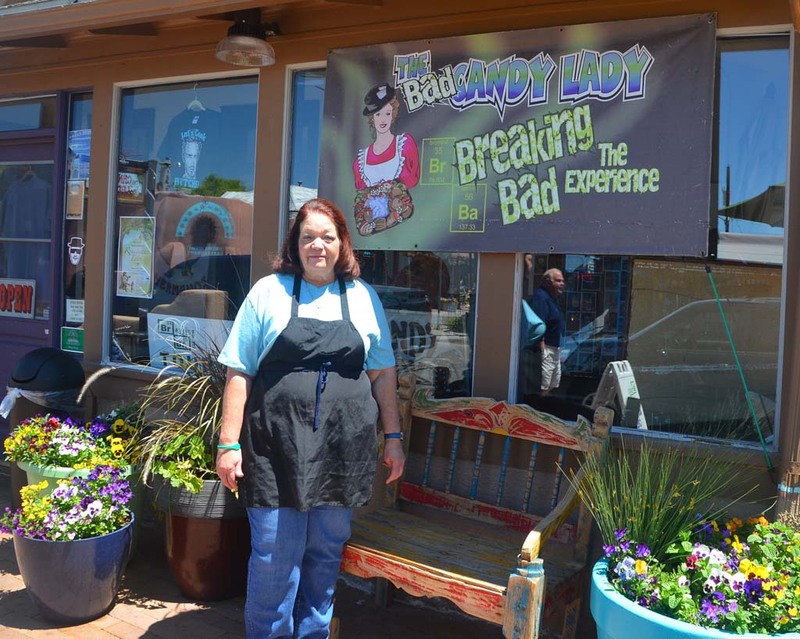 She supplied the rock crystal candy that passed for meth during the first two seasons. 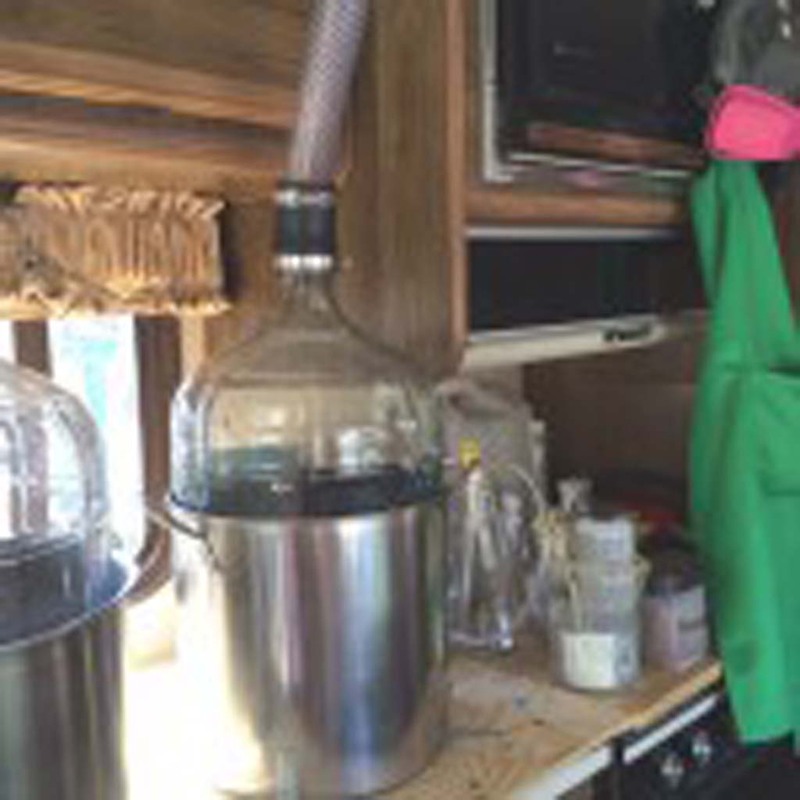 (It changed to a blue color for later episodes, and each passenger on the RV tour gets a bag of “Blue Ice”). Ball also offers replicas of the pork pie hat worn by actor Bryan Cranston after his transformation into the drug lord Heisenberg. Don’t want to buy? Feel free to put it on and take a selfie. For more info, visit visitalbuquerque.org and breakingbadrvtours.com. Council balks at two-day Fall Festival proposalRemember that old- money dress code?